Rob and Paul are best mates, albeit total polar opposites. They share a cozy bachelor pad where they engage in typical mid-20s, male behaviour – drinking, weight lifting, discussing women in graphic detail and fighting off zombies. Well into the zombie apocalypse, the lads lucked out – solar panels and generators keep them in heat and electricity, and they secured their block of flats so the undead can’t get in. But when a masked intruder turns up, their groove is properly disrupted. 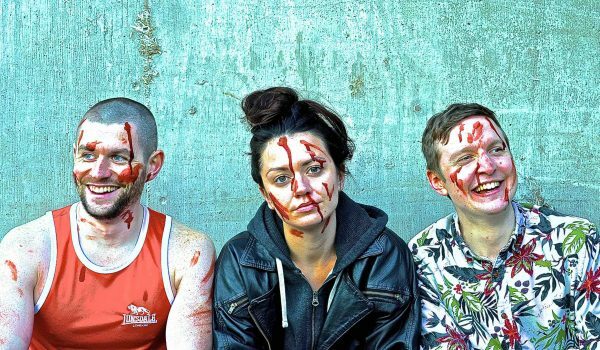 Dark comedy Living A Little is a post-apocalyptic genre mashup that’s polished and unexpectedly poignant. The idea of retelling biblical stories is nothing new. During the infancy of European theatre, the Mystery plays were popular for showing highlights of the Bible. Much later, during the 17th century, John Milton’s epic poem Paradise Lost would – contrary to author’s intentions – spur an interest in the anti-hero and biblical stories from a revisionist perspective. People over the centuries have questioned aspects of the Bible that they’ve found problematic for various reasons. Directed by Lucy Jane Atkinson, Tristan Bernays’ Testament not only addresses some of the problematic passages, but also give a voice to minor characters in the Bible.